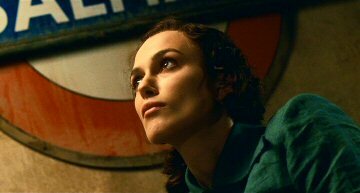 Towards the end of the film, narration refers to one character (Keira Knightley) being, "killed on the 15th of October 1940 by the bomb that destroyed the gas and water mains above Balham tube station." 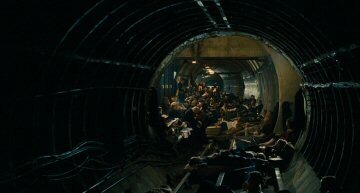 A tracking shot into the platform tunnel full of civilian shelterers intercuts with water flooding in via a connecting passageway, and the sequence ends with the character in question floating lifelessly in the water-filled tunnel. 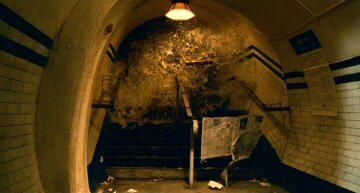 "Aldwych" was used for the platform itself, along with a mock-up of the flooding connecting passageway. 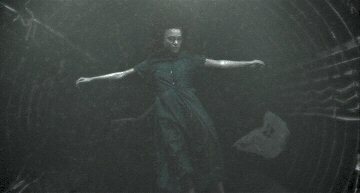 The final shot of Knightley was shot in the special 1.2 million litre water pool at Pinewood Studios (see here), and CGIed over a tunnel background. Although effective, there are a number of problems with this presentation. 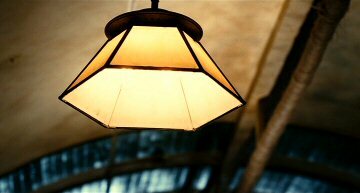 Ian McEwan's novel on which the film is based dates the event as "September 1940," but neither it nor the film's narration are correct, since the station was flooded when a 1400 kg semi-armour piercing fragmentation bomb struck the road above the northern end of the platform tunnels at 20:02 on 14 October 1940. The explosion caused the partial collapse of the north end of the northbound tunnel, which was filled with earth and other debris, and water and effluent from fractured mains and sewers. 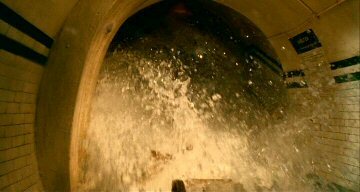 The tunnel in the film is not shown collapsing, so it presumably meant to be the southbound one, and the water coming in from the connecting passageway therefore makes sense, but it would have been nowhere near as clean as depicted, and certainly not enough for the final shot. 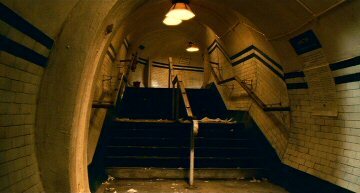 Lastly, the passageways that lead off both platforms at Balham and short, straight, and on a common level with the lower escalator landing between them, so the depicted curved passageway with stairs is incorrect.